The Battle of Algiers (film): In 1966, Gilo Pontecorvo released what certainly remains one of the best political films of cinema’s history (discussed several times on this blog). It recreates the decolonial struggle of the FLN in the Algerian capital between 1954 and 1960, and provides a verified historical reconstitution of the battle that opposed the FLN and its accomplices with the French police, then paratroopers deployed in Algiers to destroy any form of nationalist insurrection in Algiers. The film is particularly attached to show the extreme importance of the urban fabric in which this battle unfold, in particular Algiers’ Casbah. In fact, its labyrinthine, sinuous and narrow streets, as well as the vertical layers of circulations (even on the roofs) of the dense old city (half destroyed by the French colonizers in the 1830s) proved tremendously useful for the FLN, despite the success of the paratroopers in dismantling the resistant network in Algiers in 1958 (the battle was lost, but four years later, the war was won). The True Battle of Algiers: In 1971, General Jacques Massu published his memoirs of the same period of time with a title that certainly takes reference in Pontecorvo’s film, which was banned in France until that year. The addition of the term “true” to the title shows that Massu, who was in charge of the French colonial violent counter-insurgency, refuses Pontecorvo’s narrative. The fictitious character of Lieutenant-Colonel Mathieu in the film (a mix of Massu himself as well as General Marcel Bigeard, in charge of the counter-insurgency in the Casbah) is portrayed as a non-ideological professional military passionate by intelligence, strategy and accomplishing his mission, while Massu was more ideologically involved in Algeria remaining fully part of France. In 1958, he did not directly took part to, but supported the military semi-successful putsch against President René Coty’s administration, which eventually “brought back” Charles De Gaulle as President of the Republic without any election. De Gaulle, as a military-became-politician, was perceived as stronger to annihilate the Algerian decolonial movement, but pragmatically engaged negotiations with the Provisional Government of the Algerian Republic, and in 1960, Massu publicly criticized him and was subsequently fired from his position. The true battle of Algiers constitutes therefore also a narrative retroactively oriented against De Gaulle. 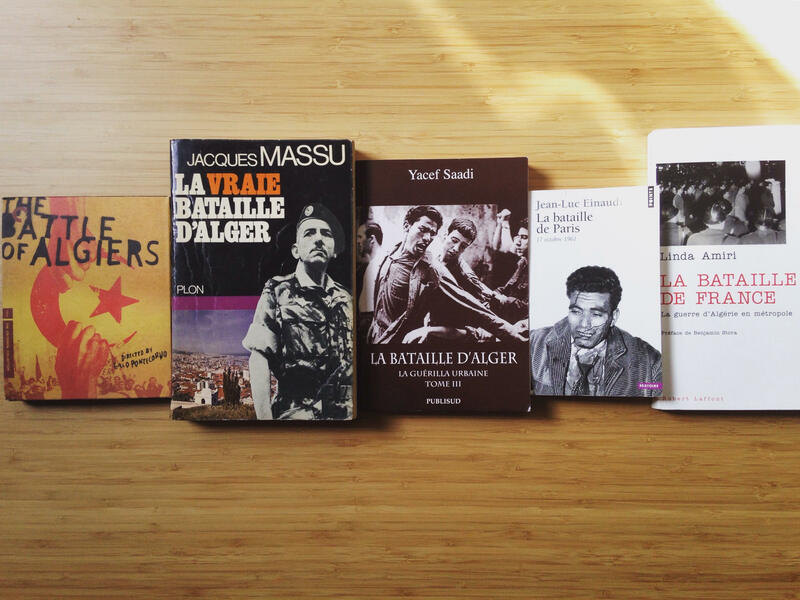 The Battle of Algiers (books): In 1984, Saâdi Yacef, one of the leader of the FLN during the battle of Algiers wrote three books recounting the revolutionary struggle from his perspective. 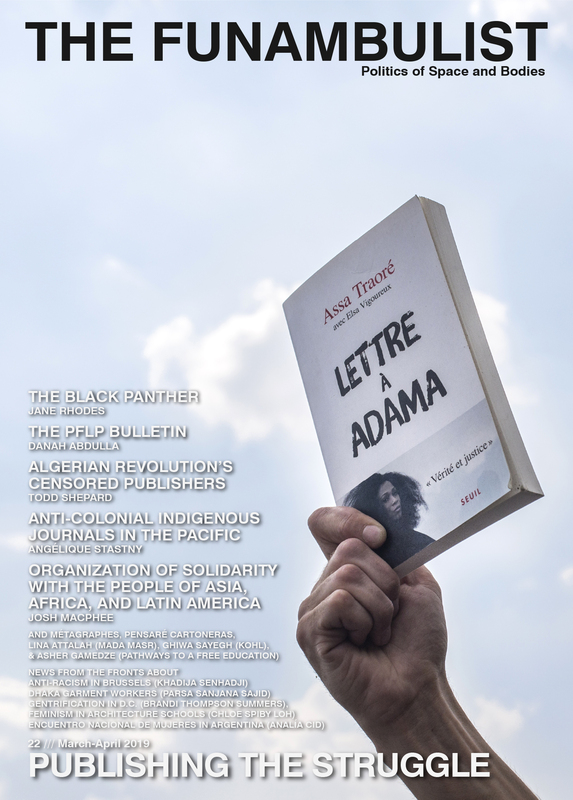 He cites Massu’s book several times to contradict it, in a dialogue that is significant in this series since Yacef had already written “Memories of the Battle of Algiers in 1962 and was a producer of Pontecorvo’s film, even playing a character strongly influenced by his own biography (called El-hadi Jafar in the film). The Battle of Paris: In 1991, Jean-Luc Einaudi continues the series “The Battle Of…” with a book that describes the key moment of the “metropolitan” equivalent of the battle of Algiers. On October 5, 1961, a curfew only targeting Algerians in the Paris region was declared by Maurice Papon, the infamous Prefect of police of Paris at that time (more on him in a future post). The FLN France Federation organized massive demonstrations of 20,000 Algerians living in Paris and its banlieues on October 17. The police suppression of these demonstrations ended as a massacre both in “hot blood” (demonstrators shot on site, numerous of them beaten with batons, many thrown in the Seine River) and in “cold blood” (torture, and systematic beating in detention for some of the thousands who were arrested and detained that evening). This event is at the core of a research I am currently doing and I will soon publish a long cartographic transcription of it on this blog. The Battle of France: In 2004 is published the most recent book of this series. Written by Linda Amiri, it is here again a direct reference to The Battle of Algiers, of course, but even more importantly to its direct “predecessor,” Einaudi’s Battle of Paris. Through this research, Amiri wanted the description of the October 17, 1961 massacre to be understood in its geographic (“Metropolitan” France) and historical (1954-1962) context. She even returned to the first significant immigration of Algerian workers in France (going from colonial subjects to immigrants in the “metropolis”) in 1912 and help us, through many quotes from the archives of both the French police and the FLN France Federation, to understand the specificity of the situation for Algerians (in general, and members of the decolonial movement in particular) working in France during the Algerian Revolution. I have (serendipitously enough) watched/read these five film/book in their chronological order and they now constitute very important documents in a research I have undertaken to propose in the future a hopefully comprehensive spatial/architectural analysis of the five states of emergency promulgated by the French State since the legislative creation of this state of exception in 1955. As the fifth of these states of emergency is still ongoing since November 13, 2015, there is no doubt that history can teach us a lot about France’s colonial continuum today.